Dave Carter is expecting another dogged performance from Jake Raine for Moneyfields against Slimbridge at Dover Road. 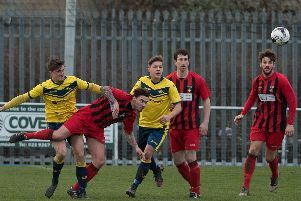 The midfielder has played an influential part for Moneys in the climb up to third in Southern League division one south. That will need to the same again on Saturday when they welcome Slimbridge (3pm). Boss Carter is impressed with the way he has stepped up his game. He said: ‘Jake has been our workhorse in midfield. ‘He has been a dogged, a battling holding player in that part of the pitch for us. ‘His work often goes unnoticed because he isn't scoring or saving goals. ‘This season he has stepped up his game and got himself a lot fitter. Though Slimbridge are at the bottom end of the league Carter won't be taking anything for granted. The visitors have won their last two games and could pose a threat. However, the home side are in good form and are looking to stretch their unbeaten run in the league to nine games. The Moneys manager added: ‘We can't afford to rest on our laurels. ‘It is important we don't read too much into our opponent’s league position. ‘We have played almost all the top teams so now is time to be professional against the lower sides. ‘This is a potential banana skin. ‘We are on a good run at the moment and would love to match the 16-game unbeaten run we had last season. ‘I feel we have a bigger and better squad this time around. ‘We have got ourselves into a good position in each of the past two seasons only to let it slip. In midweek Moneyfields won a penalty shoot-out to get past Fawley in the Russell Cotes Benevolent Cup. There is still a doubt over the fitness of Brett Poate and Matt Simm, who arrived from Fareham Town, has an ankle problem.